Back at the mansion, Solaufein is already waiting for the young drow. He immediately sends them back out for the next assignment: finding a group of 40 or 50 goblin slaves that escaped from the previous House owners. They have been located by the scouts of house Xaniqos somewhere not far outside the city. To leave Erelhei-Cinlu, they have to pass through the ghettos to make it to the Great Gates. On either side are statues of a male and female drow, with an image of Lolth above. 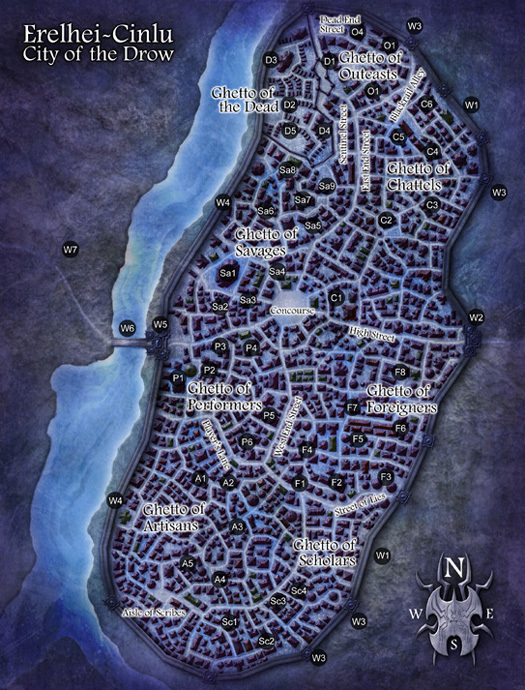 Drow can travel into the city for free, non-drow have to pay their way in. On the other side of the gates, there is a big cavern, with a small lake to the left. Lilith orders her younger sister to find the band of goblins. They march to the right for a while, where Phaedra finds a bloodstained piece of cloth. Seems they are on the right track. She soon discovers a cave and moves in stealthily. There is only one entrance and no guard. The scout sneaks closer still and then hears voices argue about the leadership of the group. She sees one taller – rather dumb looking – goblin and a group of smaller ones. Only a few of them are armed with crude weapons. Then Phaedra is discovered. The other drow quickly move in and are met by scared goblins, little ones in front. Alvra asks Lilith if he is allowed to take action, which the cleric allows. He twirls his two-bladed sword and thus manages to intimidate the leader, who drops his spears and flees to the back. From there he tries to negotiate with the fighter. Alvra grants him his life and tells everyone to drop their ‘weapons’. In reply the leader hurls a javelin at the drow, and hits. ‘That’s it, attack the worms!’ Lilith growls en walks menacingly forward. Some retreat. The wizard hurls fire at the leader and succeeds in hurting him. After a charge of Alvra, there is a headless corps decorating the cave. The others quickly surrender. Meanwhile Phaedra enters the cavern to check the rearguard, where she is attacked by a goblin who was defending the females and young. He ends up with a spiked chain in his skull. Phaedra then leads thirteen goblins from the cave. They walk back to Erelhei-Cinlu in formation, the remaining thirty new slaves in tow. Upon the arrival at House Xaniqos, captain of the guard Solaufein takes over the goblins and leads them to the slave quarters under the mansion. The four drow proceed to the central hall to report to the Matron Mother and walk into a mass praying. Irritated by the low tasks they have received so far, Lilith remains erect at the entrance of the room. Perhaps not such a bright idea. Indignant, the Matron Mother allows her eldest daughter to punish the disobedient cleric and Quarra makes the whole group go down on their knees to pray… long! After that they are dismissed without even a comment on the completed task. Lilith praises Alvra for his excellent fighting and heals him as a reward. Though a bit grudgingly. All four then go to their rooms to pray and prepare for the next day. Seems Lolth was satisfied after all, since all feel better prepared for the upcoming events. After the hasty withdrawal, they find themselves in a kind of art gallery with only one exit. Captain of the Guard Solaufein, in heavy armor with a large sword and a shield on his back, is already waiting for them. He gives directions to ‘Nyttoris Arms & Armor’, where they are to pick up the weapons. The shop is situated in the Ghetto of Artisans in the south-west of Erelhei-Cinlu. Solaufein warns them about Nyttoris’ shrewdness and tells them not to fall for his tricks: all has already been paid for! Two minotaur guards open the gates into the city. Once past the gate, they find themselves in the Ghetto of Performers, where a drow female of the House of Vae, wearing a superior smirk, passes by with a number of house slaves. They lead new ’employees’ by leashes. Apparently she has just bought new slaves. Then they cross into the Ghetto of Artisans, where fine arts thrive. The group makes its way to ‘Nyttoris Arms & Armor’, housed in a big building. Lots of sounds are coming from an open door that leads to the entrance hall. Inside Lilith almost trips over a troglodyte. What the…?! Annoyed she growls for it to make way and when it does not react immediately, the cleric simply kicks it aside. During a second, the troglodyte shows the tiniest bit of protest, but after a deadly glare the animal averts its eyes and crawls away. They enter a shop where many of the species are working on various tasks and mages cast spells on armor. Then a small and slender drow approaches: Nyttoris. Irritated by the insolent troglodyte, Lilith is not in the mood for small talk and quickly gets to business. Nyttoris hands Alvra a magnificent two bladed sword. Alvra spins the weapon expertly and then attacks a troglodyte to test it. Apparently the sword passes the test, since the reptile is cut in half. The drow fighter thanks Nyttoris, after which the other troglodytes clean up the mess. Then Lilith becomes the owner of a masterwork flail, while Phaedra receives a sparkling spike chain. A dashing rapier brings a smile to Jharrath’s face. All are content. Lilith thanks Nyttoris for his excellent craftsmanship and tells him she will recommend his services to the Matron Mother. As they walk away, they hear a shout for mercy being cut off. Seems Nyttoris has been informed of the insulting behavior of his former servant.